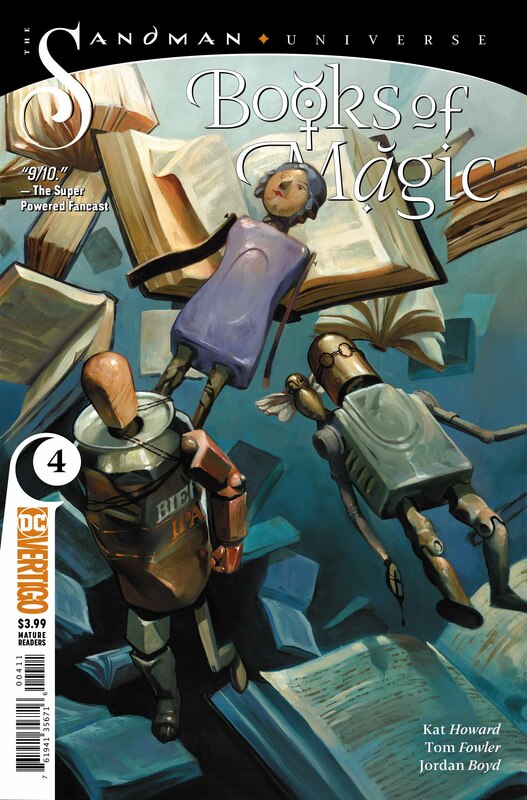 Books of Magic is the combination of many different things, all of which I am absolutely loving seeing come to life on the page. 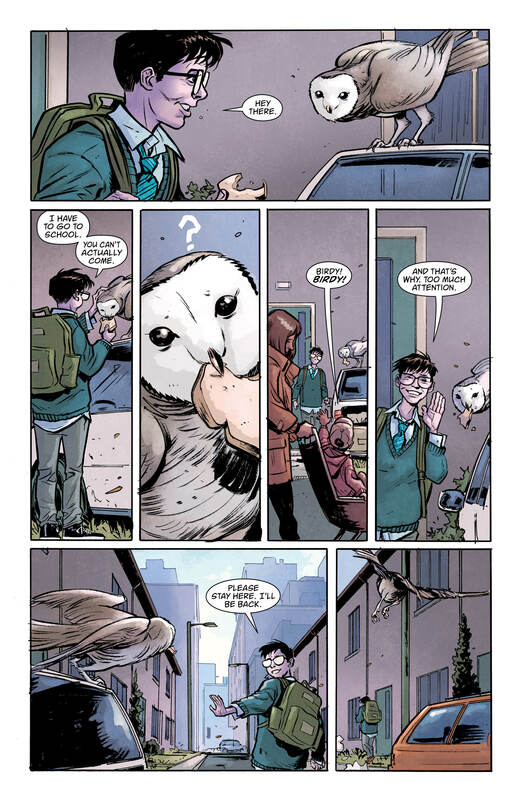 It seems at first that this latest issue is a wholesome return to normality for Tim as he takes a step back from magic to get to know his feathered friend and some of the cute girls at school. 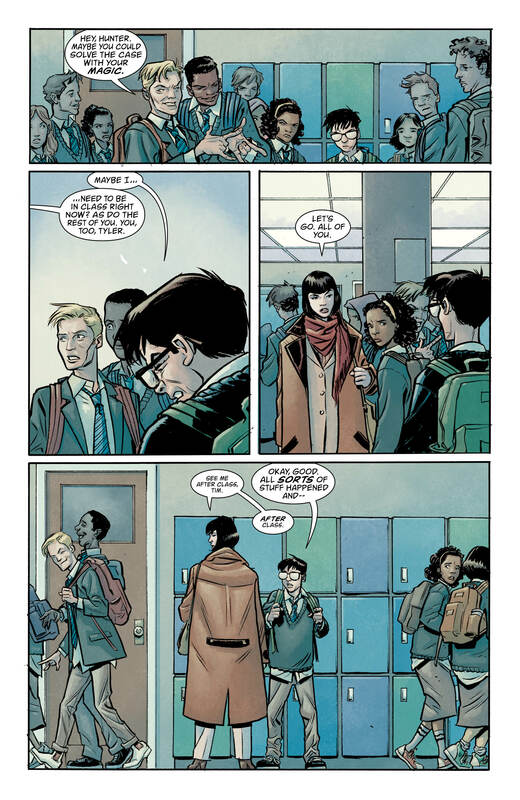 However, in the very next panel writer Kat Howard brings us right back to the familiar balancing act of Tim trying to figure out his new powers whilst maintaining the illusion of being your average slightly nerdy teenager. The two worlds he inhabits are blurring in more ways than one with his little slip ups, and now with even more foes coming out of the woodwork, Tim turns to his past (and other realms) to find out just why he’s having these nightmares. 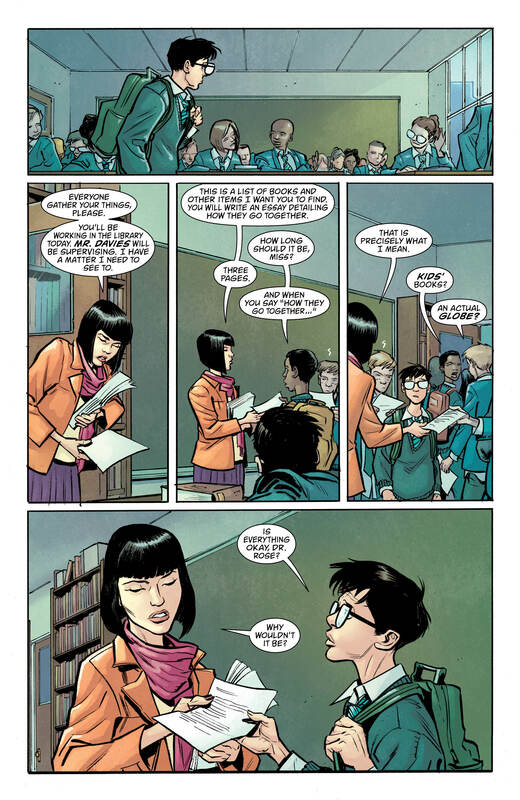 The main draw for this series is the way the creative team manage to get so much out of what appears, superficially at least, to be a fairly seemingly simplistic story. 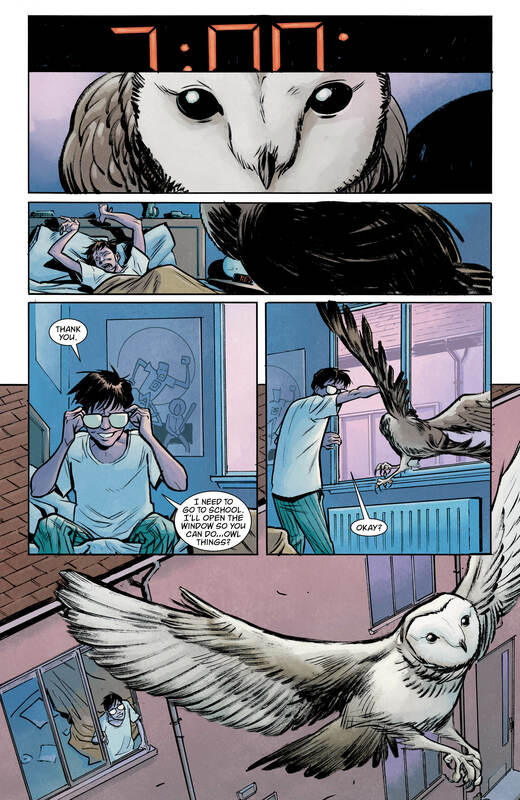 On the one hand we have the classic coming-of-age-tale-with-the-magical-twist; replace the owl with a dog, the magic with spider-powers, or London for New York and you’d have a wonderfully relatable tale of growing up. But within that we have a world of dark intrigue and deadly cults, with all manner of clues to unanswered questions pushing the reader along. Also, after this issue it’s difficult not to be reminded of just how embedded this story is in the wider Sandman/Vertigo universe, and how it calls back to the original issues while at the same time updating things slightly to fit with a modern world and a modern audience. Tom Fowler and Jordan Boyd’s striking depiction of the world illustrates this perfectly with just how softly drawn and bright everything is. 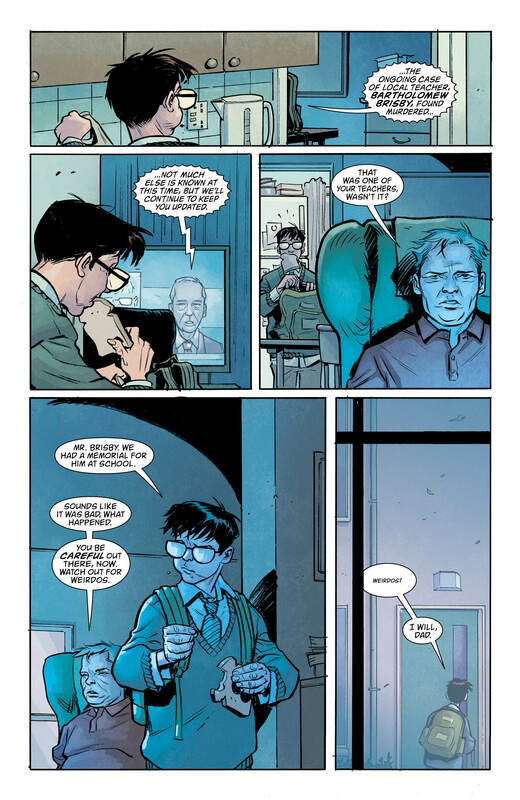 The toys present in Tim’s room provide a humorous nod to DC heroes, and the almost smiling of his owl in one particular panel goes a long way to illustrate the closeness the two already have. It’s this approach which also makes it particularly shocking when the tone suddenly shifts into the manic depiction of the bad guys or a moment of intense violence, almost making it feel more ‘real’, and that these events could happen at any time. 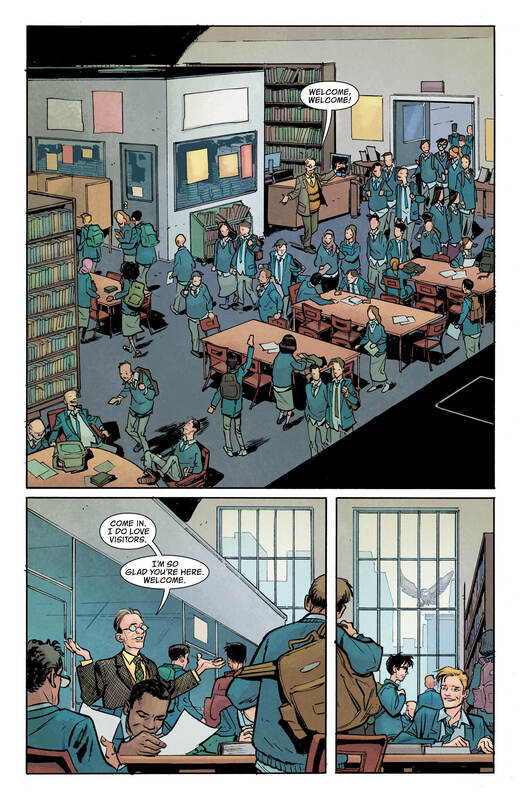 This latest issue also ties the series to another Vertigo title in a very sudden, very unexpected way, making me wonder whether we should be expecting some of the other titles to start overlapping too – something I’ve been hoping for since reading Dreaming #1 all those months ago. At the end of the day, this is a wondrous modern fairy tale with some genuinely likeable and relatable characters. It provides just the right amount of a mirror to our own world, along with plenty of escapism to ensure its readers become more and more interested with each passing issue. Highly recommended.